At the end of one of the anarchist Mayday Marches last Sunday an abandoned city-owned listed building was occupied to be converted into a self-run social center for refugees called Mukhayyam. Prospects looked good since the leftwing city council has banners reading ‘Welcome Refugees’ just round the corner. However on the Tuesday morning 200 riot police evicted the building (see video below). The mayor Ada Colau claimed she knew nothing about it and that the Catalan Govt (also left wing) had ordered it ( they weren’t city police). Dozens of activists had occupied after the ‘anarchist and feminist’ demonstration of Mayday to remake it as a welcoming space for refugees (Spain has promised to accept only around 16,000 but a mere 18 have been cleared so far). At eight o’clock on Tuesday vans of the Mobile Brigade cut off all the streets near the building in the Gothic Quarter. A squad of agents charged the front doors of the building and smashed in with a battering ram at 7.00 in the morning. It was a door with a high architectural value, included in the catalog of heritage of the City of Barcelona. At the time of the police assault there were 17 people inside the building. One of the activists explained to the paper La Directa: “The officers interrogated, identified and photographed us, and wanted to know if we are members of the anti-racist feminist collective”. 4/May/16. Asturias: A man aged 30 died after being arrested by police evicting him this afternoon . There have been over 600,000 evictions since the housing bubble burst, with properties sold off by banks to Corporations. 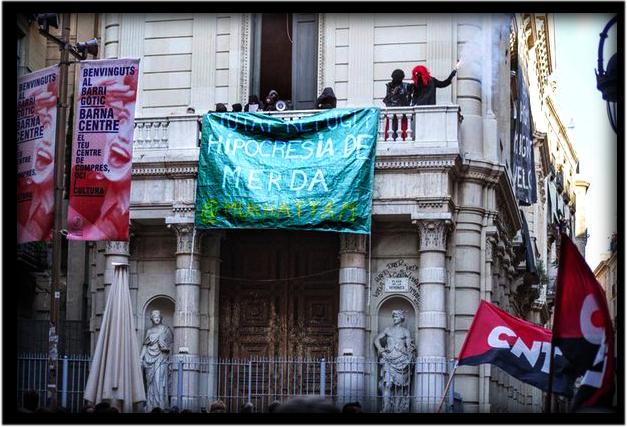 In Spain eviction doesn’t cancel mortgage debt payments which continue till you die and then pass to any guarantor. “Once we were held, they took our mobile phones and evenmade photos and sent them on their lists of WhatsApp, taunting us,” detailed one of the occupants. The 17 people detained were released gradually and joined an improvised concentration with supporters whoi welcomed them on Calle Avignon. “None of us have been shown any eviction order” they affirmed. The Office of the Spokesman of the Catalan Police has failed to explain whether this order exists or not to demands from La Directa. “We are making efforts, we will call you when we know” they claimed. After the eviction they expressed disagreement with the police deployment: “We were not allowed in or out.” “They have broken the front door, have cut the chains of the gates and say they want to brick it up (which later happened). ” he said. The occupants, once expelled, have demonstrated for an hour on the street Avignon and then moved to the Plaça de Sant Jaume. Today at eight p.m. they have called a rally at the square.